The 10 Best Ice Skating Rinks in Indiana! Indiana is home to a handful of ice skating rinks, some seasonal, some year-round. Either way, each of these rinks provides warm memories in addition to the fun and excitement of laying scratches in the ice. Check out Indiana's 10 best ice skating rinks and what they have to offer. Carmel Ice Skadium is more than an ice skating rink, it's a hockey rink, ice school, and party zone, too! In addition to public ice skating sessions, the Skadium also hosts amateur adult hockey leagues for all ages, skill levels, and experience levels. Stick-n-Puck is a hockey workshop for all ages (Jr. Stick-n-Puck is available specifically geared toward parents and their kids) to build hockey skills like shots, blocks, passing, and better stick handling. For those who wish to glide with a little less Kevlar on your body, you can sign up for figure skating lessons with the “Learn to Skate” program. Just can't get enough Carmel Ice Skadium? If you come in rave clothes (with a sweater) on a Friday or Saturday night, you'll be perfectly dressed for the Cosmic Skate where the lights go down and the music goes up! The Skadium also hosts birthday parties, amateur figure skating clubs, and a very special ladies-only skating club called Coffee Club, a figure skating intensive lesson program followed by fellowship time over hot coffee. The Arctic Zone Iceplex, similar in session prices to the Skadium, is also a multi-service ice rink that offers lessons in figure skating and hockey in addition to public skate sessions. The Iceplex's hockey program is quite a bit more structured, however, with adult leagues divided into tiers, and kids' hockey a separate entity. The Iceplex also boasts an on-staff personal trainer for high school hockey players who want to enroll in the high-intensity weight training program. For something a little less sport-driven, the Iceplex offers two party packages for your next special occasion, including a one-hour slot for the party room, 10 skating passes, and a party host to assist you in pulling off a fantastic party for your guest of honor. The Iceplex also offers a Friday and Saturday-night Cosmic skate, complete with laser lights, fog, and cranked-up music. For skaters who prefer the out-of-doors for their skating experience, the Merrifield Ice Rink in northern Indiana is an excellent venue. Of course, you can attend any of their open skate times for a very reasonable admission price, but the ice rink specializes in specific skating events for various holidays! A guest favorite is the Valentine's Day skate, a four-hour couples' skate time with popcorn and hot chocolate for you and your sweetheart. Yet the Merrifield Rink also recognizes that some of their pint-sized patrons think kissing is yucky, so have worked it out with beloved cartoon characters to come on a special day and skate with them. On certain nights, the ice rink also recognizes the selfless service of America's veterans, so set aside those dates as free skating times for active and veteran members with military ID. Are you serious about ice sports? SportONE is the rink for you. From figure skating academies and camps to hockey academies and camps for all ages, including the Adult Safe Hockey League and other formal hockey leagues, SportONE Icehouse is serious about ice sports and getting you in on the action. They host birthday parties, but their real niche in the ice sports market is their dedication to providing rich ice sports education. No experience? No worries. 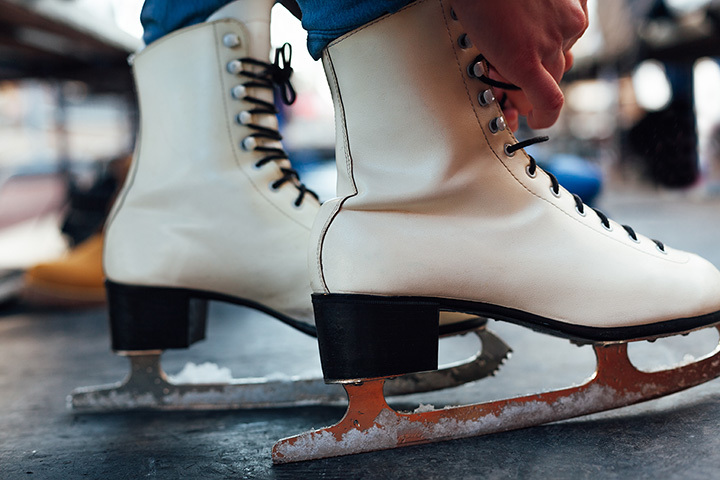 There are lessons available for those who have never put on a pair of blades before, but expect to be driven, drilled, and trained to higher and higher levels of ice skills. It's not cheap … involvement in the SportONE programs is an investment, but the richness of curricula and training will make it well worth your time, effort, and money. For those looking for a more intimate skating experience than a regulation NHL-sized indoor rink, the outdoor seasonal Riverside Skating Center is a lovely choice. Offering private and semi-private skating lessons for a very reasonable fee, the Riverside Skating Rink is a laid-back option for those who want to get their feet wet—rather, get their toes cold—before venturing out during a public skate time. Renting the rink for a private function may be cost prohibitive, especially for only two hours at a time, but it is available—the limit for large groups is just over a hundred skaters. One special Saturday in December, kids and a parent can make reservations to skate with Santa! Bring your camera for a precious picture opportunity, and bring your appetite because you know Santa, he's got to have his sweet treat! Hot chocolate and donuts will help to warm you and Santa after a chilly morning of fun on the ice. The Hamilton Center Ice Arena is a double treat for the architect in your skating group: Harry Weese, architect of such incredible structures as the District of Columbia's Arena Stage and Chicago's Time-Life Building, was also the architect of several buildings in Columbus, Indiana, including the Hamilton Center and Ice Arena. The rink itself is simple and ice sports lessons (including broomball) give flavor to its very affordable open-skate session calendar. Unlike the Riverside Skating Center, the Hamilton Center will cancel open-skate sessions for special events such as princess/superhero birthday parties (complete with characters!) and special sessions for local school classes, so keep an eye on their calendar if you're thinking about lacing up. Notre Dame fans, rejoice! You can lace up your skates and scratch the same ice that Indiana's very own Fighting Irish have done for generations! The Compton Family Ice Arena, home of the world-famous team, is open for public skating, “My Tot and Me” parent/child sessions, and the University of Notre Dame Skating Academy's “Learn to Skate” program. You can also catch their “Try Hockey” event and try your skill at shooting the puck Fighting-Irish style. Of course, if you're a student at the prestigious university, you can skate for a reduced price with your valid ID, but you already knew that, didn't you, smarty-skates. Gotta love those student perks. Bloomington, another of Indiana's famous college towns, is home to the Frank Southern Ice Arena. Although not officially affiliated with Indiana University, the IU Credit Union is among the sponsors of the arena, as are the Bloomington Blades and Ray Skillman Ford. In addition to hockey and figure skating lessons, the arena also hosts special events like Skating with Santa, where you can enter the “ugly Christmas sweater contest” for a prize and Lunar Skating, when they flood the rink with moonlight effect and the best music of the 1980s up through today's chart toppers (those sensitive to strobes and other special lighting effects, beware). If you ask nicely and pay a very reasonable fee, staff at Frank Southern Ice Arena will sharpen your blades for you before you take the ice! Deep River Water Park makes a splash in summer, but it's open in winter for skating, too! The Plaza within the park is turned into an ice rink from November to February with open skate times and birthday party availability at a per-person price. Park staff will also sharpen your skates for a reasonable fee. At Deep River and the Ice Plaza, there is no hockey in sight, because flying pucks pose a problem for the Christmas lights that festoon the rink for the season. Birthday parties aren't the only events that the park will help you pull off: fundraising skate-a-thons and youth group and team functions are also encouraged. No spiking the hot chocolate, please … Deep River Water Park is an alcohol-free property. Besides, impaired senses and slippery surfaces never did mix well. Swonder Ice Arena near the southern tip of the Hoosier State boasts not just one, but two NHL-regulation-sized skating rinks, and a fitness center on the mezzanine. Swonder's claim to fame, though, is its history of hosting formal functions and events for such organizations as the Young Women's Christian Association (YWCA) and the American Diabetes Association. Swonder also hosts showcases and competitions for local and state clubs ranging from ladies' skating to men's and youth hockey, even including the University of Southern Indiana's own hockey team, the Ice Eagles. Swonder is more than a skating rink, it's a fitness center, too. Yoga and Zumba classes are available, as well as no-contract, no-dues memberships to the gym and weight room. Since Swonder recognizes that more people like birthday cake than treadmills, the rink also hosts very affordable birthday party packages during the public skate time (the more the merrier, right? But if you'd rather have a private party, you can arrange one at an additional cost). View more Indiana Ice Skating Rinks.